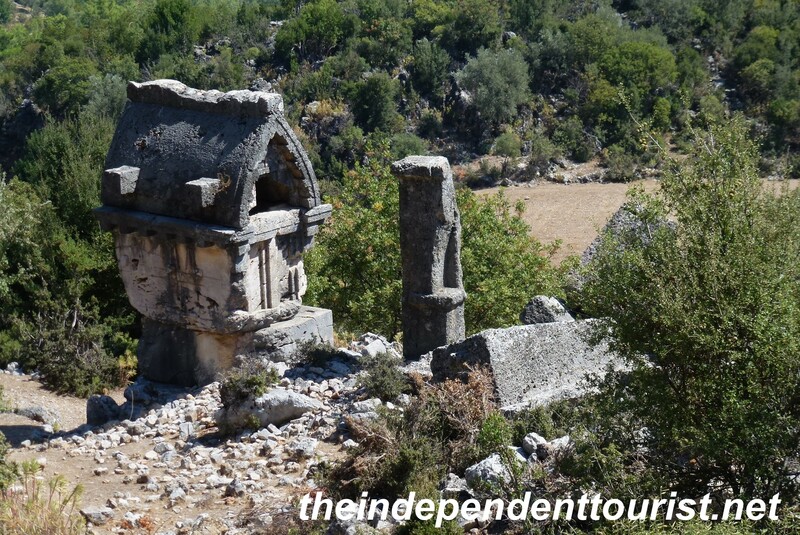 If you enjoy visiting ancient ruins without throngs of people everywhere, check out Pinara, located northwest of Kaş, not too far from Fethiye. 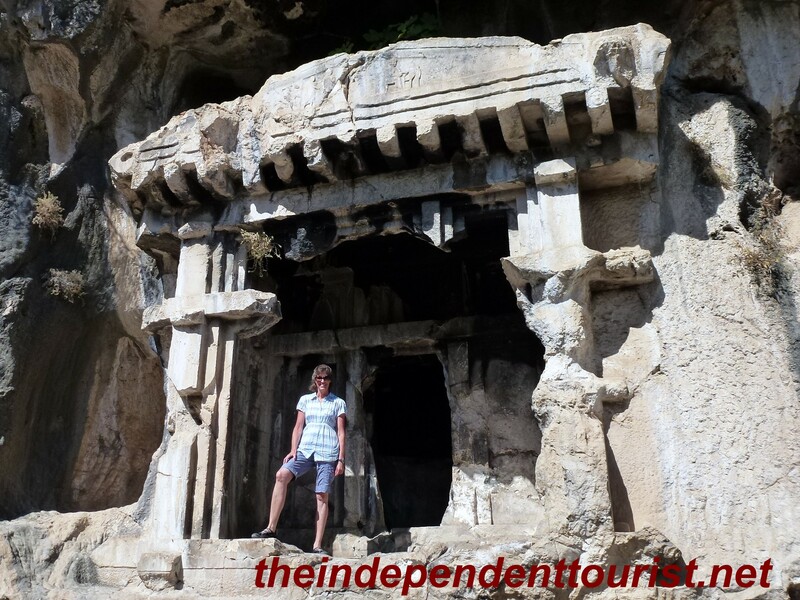 This part of Turkey (known as the Lycian Way) is very scenic. (For a map of sites visited in Turkey, click here). Kalkan Beach, one of the postcard images of Turkey. 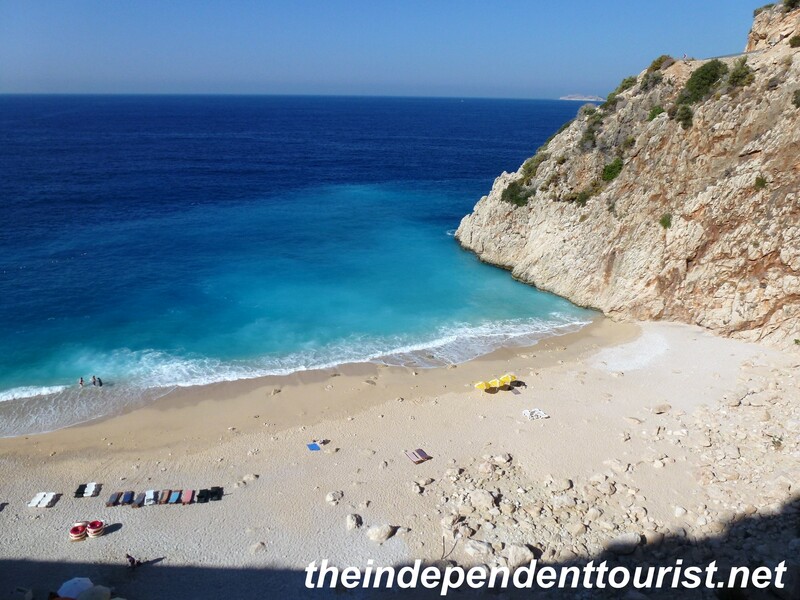 This stunning beach is just west of Kaş, right where the road turns north and inland towards Pinara. 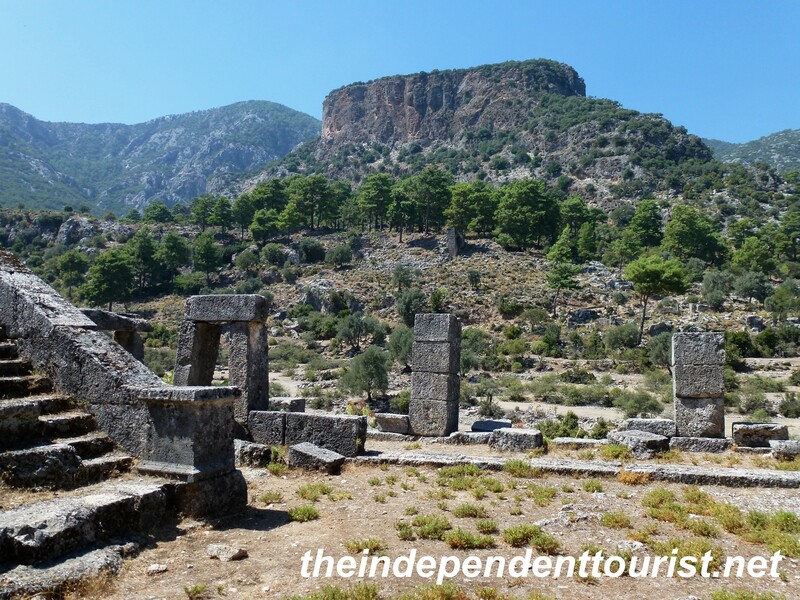 Pinara was one of the six major Lycian cities (beginning about 7th century BC). 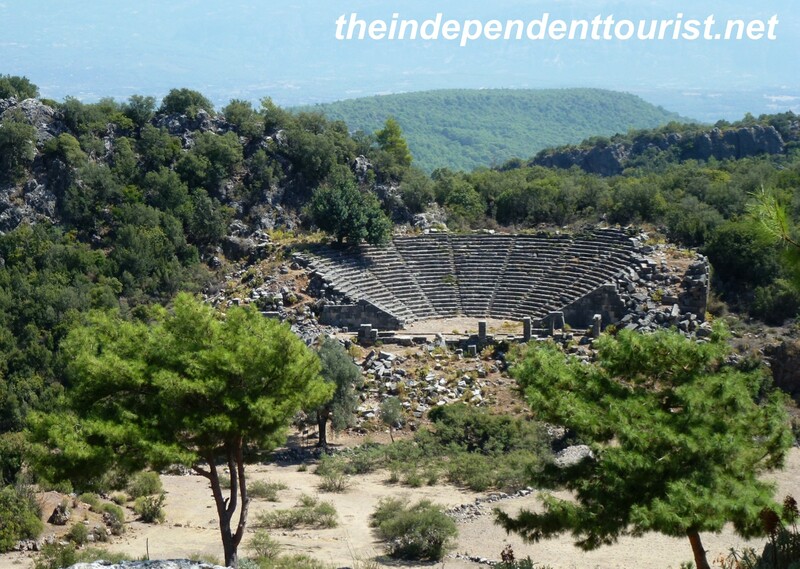 The better-known ruins of Xanthos, which was the capital of Lycia, are nearby as well as the ruins of Letoön. A view of the theater at Pinara from the agora. A free-standing tomb at Pinara. A view of Pinara from the theater. The hilltop in the middle of the picture is round, giving Pinara its name (Pinara means “round”). 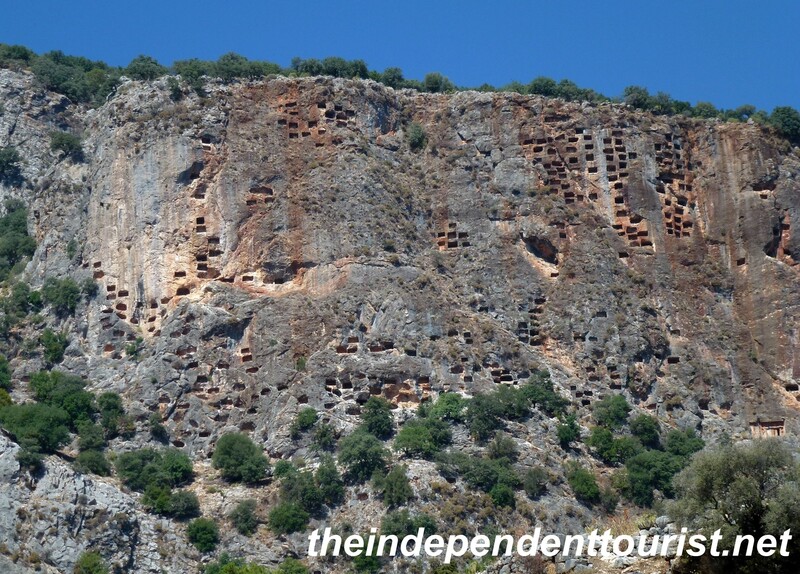 The hillside is covered with tombs cut into the rock cliffs. A closer view of the hillside – note the rock-cut tombs into the hillside. How did they do that? Pinara is a large site and we moved our car a couple times to different locations to save some hiking back and forth. A short history of the site is posted at the entrance but no map was available. Signs point the way to some of the main ruins, but be sure to hike beyond the area around the first parking lot, since there are numerous hidden ruins along faint trails. Pinara is about 6 km off the main road (D400). The last 2 km of road is dirt/gravel, which is passable by autos. There were two caretakers at the site, and basic restrooms. Bring your own water and snacks. The entry fee was 5 TL (1.8 Turkish Lira per USD). The easiest way to visit is by rental car; a brown sign on the main road marks the turnoff to the site, as with other tourist sites throughout Turkey. One of the house tombs at Pinara. The “Bull-Headed” sarcophagus (note the top of the tomb), near the agora. Allow at least two hours for your visit. A variety of ruins can be explored—a theater, temple foundations, tombs carved out of rock and free standing, an agora, and baths. We also went up a steep dirt road a few kilometers behind Pinara just to explore the countryside. 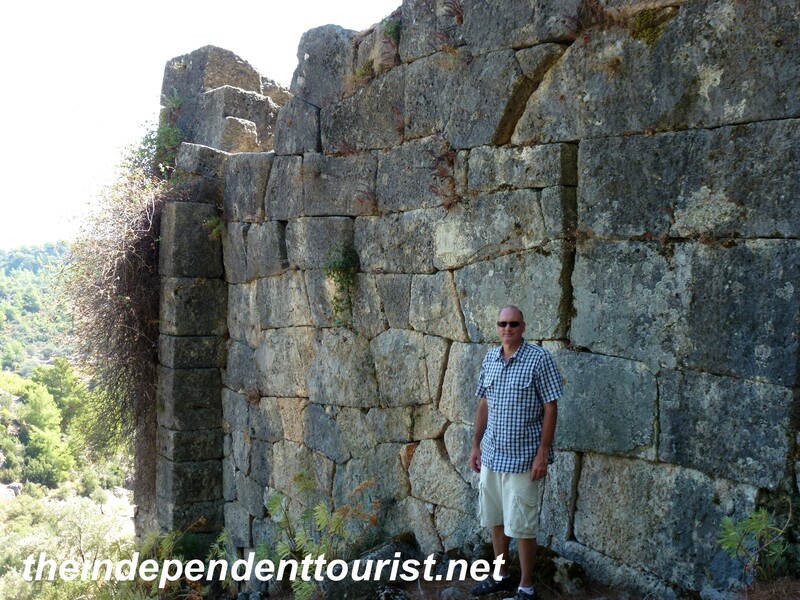 I loved this place—the ruins are extensive and interesting, the countryside is scenic, and the fact that there are almost no tourists makes it a great stop. The temple foundations at Pinara – note the fine stone-fitting work. 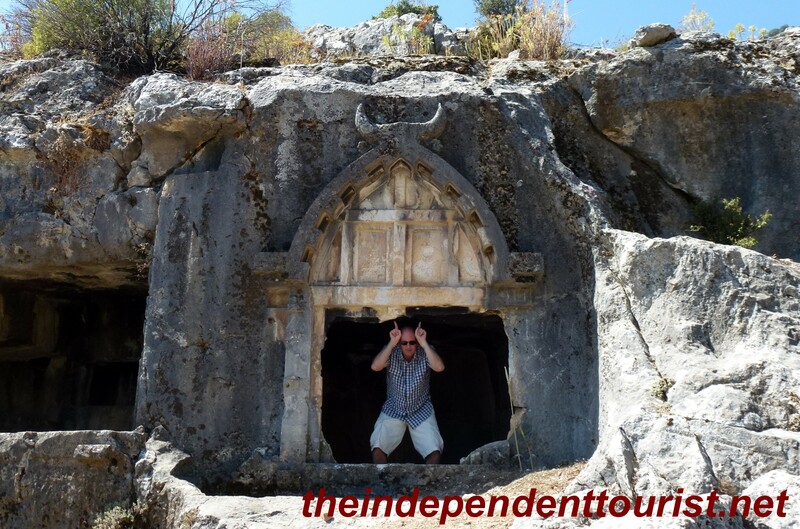 Posted in Turkey and tagged Lycian Cities, Lycian Way in Turkey, Pinara, Things to see in Turkey, Turkey Travel on February 10, 2013 by Paul Terry.